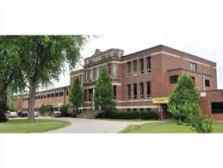 Ridgeway-Crystal Beach High School began in 1909 as part of a Public School located at the Masonic Temple (next to the Avondale on Ridge Road). In 1921, it outgrew its building and the school moved to the current site of Ridgeway Public School. At this time, all grades were taught on one site. In 1927, the ground was broken on the current site and the central area of the school was built. In 1956, the cafeteria was built. Prior to 1960, the school extended as far as the Guidance Office. This included the new Family Studies and Industrial Arts room. In 1966, Rooms 110, 111 and the two Science labs upstairs were added. The library extension soon followed.. At the same time, the upper gym and the adjoining change rooms were added. In 1987, the Auditorium was refurnished with permanent, comfortable seats on raised platforms. In 1989 construction started on a new all weather track. A field house was added in 1991. In 1993 a state of the art weight training and exercise room was added. During the summer of 1995 a Communication Technology complex was constructed.